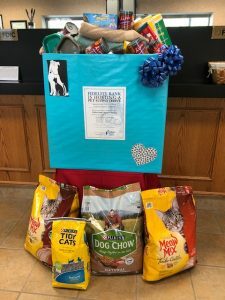 In response to the effects of Hurricane Florence, the Fidelity Bank Lillington team hosted a pet supply drive benefitting the Harnett County Animal Shelter. The drive, which was held between September 28th and October 12th, was a success with over two full boxes of items donated. Customers, members of the community, and branch associates donated food, cleaning supplies, blankets, and other animal items to support the shelter and those in the community that were impacted by the hurricane.